Enjoy a game of beach volleyball on Memorial Day or 4th of July while being proudly patriotic-the red, white, and blue stripes featured on these beach balls scream U - S - A! Simple to use, just blow up and serve up a game the founding fathers would love to take part in. What's more, each of these beach volleyballs can be easily inflated and deflated to fit into extra small storage containers, and re-inflated for re-use to ensure, whatever the holiday, whichever setting, you'll have the makings for a patriotic game of volleyball! 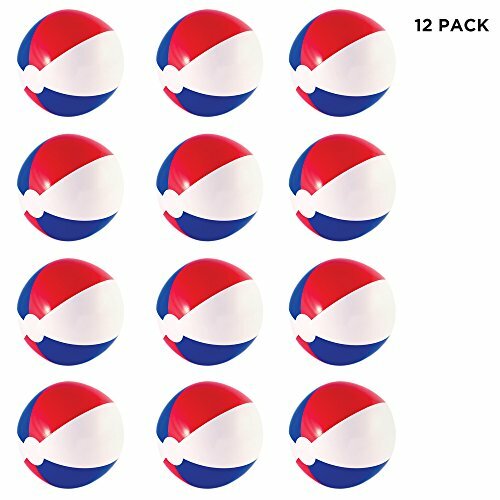 This party pack includes 12 patriotic beach balls, making them excellent party favors, prizes, and incentives for Memorial and 4th of July parties, carnivals, office picnics, and more! BEACHSIDE PATRIOTISM: Have a (patriotic) ball at the beach this summer with our red, white, and blue beach balls, whose broad stripes scream U - S - A! SIMPLE TO ASSEMBLE: Just blow up and serve, simple as that! These beach balls are easy to assemble so you can get your game started as soon as you hit the beach. INFLATABLE FOR COUNTLESS SETTINGS: Measuring 16'', each of these beach volleyballs can be easily inflated and deflated to fit into extra small storage containers, and re-inflated for re-use which ensures, whatever the holiday, whichever setting, you'll have the makings for a patriotic game of volleyball! Durability and longevity assured! PATRIOTIC HOLIDAYS: Celebrate American pride by serving up a sense of airborne Americanism. Our red, white, and blue beach balls are perfect for starting a fun-spirited, patriotic volleyball game on any patriotic holiday, from Memorial Day to 4th of July. EVERYBODY CAN HAVE A BALL: This patriotic party pack includes 12 red, white, and blue beach balls which make excellent party favors, prizes, and incentives for Memorial and 4th of July parties, carnivals, office picnics, and more!